Ralph Cookerly Wilson Jr., founder of the Buffalo Bills and the most influential sports figure Western New York ever has known, died Tuesday at age 95. “He passed away peacefully at his home with his beautiful wife, Mary, and his daughters by his side,” Bills President and Chief Executive Officer Russ Brandon told The News while at the NFL owners meetings in Orlando, Fla.
Wilson’s death will prompt the sale of the Bills, but that transfer of ownership could take numerous years, during which time the team will be operated by a trust. Wilson did not put Buffalo on the map, but did as much as anyone to keep it there. He brought major league sports to Buffalo in 1959, when he joined a group that became known as “The Foolish Club,” eight businessmen led by Texas oilman Lamar Hunt, who founded the American Football League. The initial cost to Wilson was $25,000, and challenging the established National Football League was considered a risky venture. The investment became a stroke of genius, as pro football blossomed into America’s favorite sport. Wilson’s team is valued today at roughly $870 million, based on estimates by Forbes Magazine. The Bills arguably are the single-most identifiable and unifying institution in Western New York. • What is next for the Bills franchise? relationship with Western New York problematic. He was at times admired, reviled, scorned and beloved, depending largely on how his team was performing on the field. Gradually, Wilson came to be widely esteemed for his loyalty to the region. Seattle wooed Wilson in the early 1970s, but he waited for Western New York to build him a stadium in Orchard Park. From 1980 to ’95, the NFL saw teams move out of St. Louis, Los Angeles, Oakland, Baltimore, Houston and Cleveland, all for the promise of bigger profits in other markets. Wilson stayed in what is a shrinking market, the second smallest in the 32-team league. Wilson’s sense of loyalty extended league-wide. He voted against every franchise relocation that ever came up and in so doing was regarded by associates as “the conscience of the NFL,” someone who stood up for the tradition of the game. His role in founding the AFL and helping it succeed was the big reason he was inducted into the Pro Football Hall of Fame in Canton, Ohio, in 2009. Wilson’s influence on the NFL was broad. He kept the Oakland franchise afloat with a $400,000 loan in 1962. He was a key player in negotiations on a television contract in 1964 that transformed the AFL into a major threat to the NFL. He had a critical, behind-the-scenes role in negotiations that led to the AFL-NFL merger in 1966. He was involved in every key committee that made NFL policy in the 1970s and ’80s. While the Bills by far were his No. 1 passion, Wilson oversaw many other business interests throughout his life. He was born Oct. 17, 1918, in Columbus, Ohio. 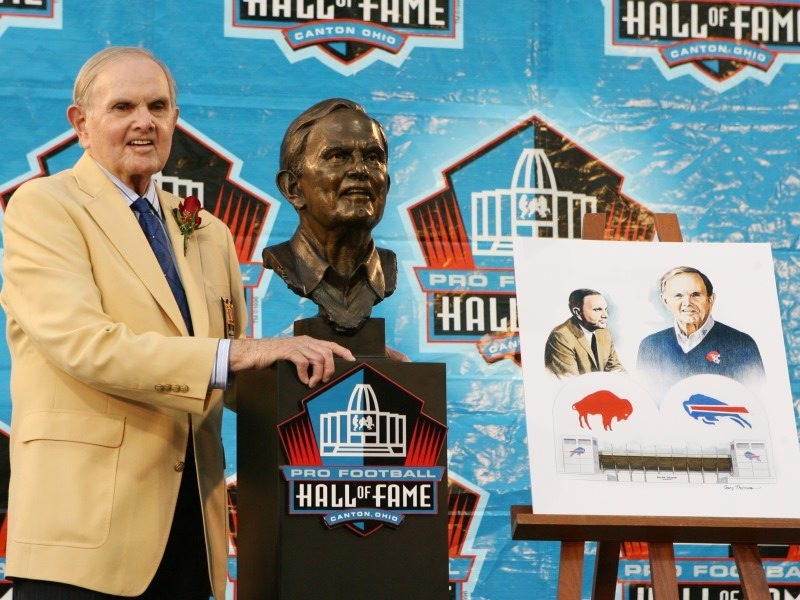 His father, Ralph Wilson Sr., was a renowned salesman who made a fortune selling insurance. After serving in the Navy during World War II, Wilson joined his father’s company and helped expand it into a multimillion-dollar conglomerate. Over the years it included an insurance company, one of the nation’s largest trucking companies, one of the nation’s largest concrete-paving firms and several television stations, among other businesses. Such a multifaceted career was befitting a man whose personality was complex. Loyalty was just one of his distinctive traits. He was fiercely competitive, unpretentious and generous. He could be mercurial and combative. He took pride in being a risk-taker. Wilson’s competitiveness stretched from the negotiating table to the tennis court. He was an avid tennis player. During Bills games, Wilson did not like to be bothered. Guests to his suite usually were instructed: The owner is to be left alone in his seat at the end of the box and not to be interrupted while watching the game. Bills employees over the decades experienced his intensity. Some of Wilson’s critics complained that little things could put a person on his bad side. Former Bills General Manager Terry Bledsoe was said to have fallen into Wilson’s disfavor partly because of his habit of putting his feet on the owner’s desk during meetings. Wilson’s temper, once ignited, ran hot. He was fined by the NFL on several occasions for criticizing officiating after games. Wilson insisted on being intimately involved with his team, which is what led to rifts with two of his most heralded football men, Chuck Knox and Bill Polian. Both were fired in part because he felt they were not including him or his aides enough in team matters. Wilson never was able to fully forgive former coach Lou Saban for what he considered a breach of loyalty. Saban quit as coach of the Bills twice, and the owner always blocked Saban’s induction onto the team’s Wall of Fame. Wilson was consumed with owning his team. It was his passion, which is why he refused to consider selling it or giving up any control of it during his lifetime. It’s also why he was distrustful of putting control of the team in the hands of someone he did not know. Wilson liked to check in with his top football man – whether it was Polian, John Butler or Buddy Nix – every day. Often, Wilson checked in multiple times a day. His love for the team and his hesitancy to entrust it to an outsider often led him to hire from within the Bills’ fraternity when looking for a person to run or coach the team. Sometimes it worked out well. Polian happened to be the nearest bystander with football management credentials when Wilson was looking for a new overseer late in 1985. Wilson recognized Polian’s managerial skill. Polian built what became the team’s Golden Era, the run of four straight Super Bowl appearances from the 1990 through the 1993 seasons. Polian hired Marv Levy as head coach and Butler as college scouting chief, and he signed Jim Kelly to be the quarterback in ’86. The Bills made the playoffs 10 times in a stretch of 12 seasons from 1988 through ’99. Buffalo is the only team ever to make four straight Super Bowls (and lose them all). Often, however, the penchant for hiring the person close by with whom he could trust did not work out. Coaches who were promoted and failed included Joel Collier, Harvey Johnson, Jim Ringo, Kay Stephenson and Hank Bullough. After outsider Tom Donahoe failed to turn around the franchise in the early 2000s, it made Wilson even more reluctant to cast a wide net in searching for a football manager. That led to Levy’s return as general manager from 2006 to ’07, a stint that flopped. Off the field, Wilson’s organization is a model for small-market success. Under the direction of Russ Brandon, current team president and CEO, the franchise has used a campaign of regionalization to increase revenue and fill its stadium. On the field, Wilson searched in vain for the key to success since 1999. The Bills have missed the playoffs a franchise-record 14 straight seasons and have posted just one winning season in that stretch. It’s the longest active playoff drought in the NFL. Wilson’s spending habits long have been the subject of debate and criticism among Bills fans. He had one of the big payrolls in the NFL throughout the 1990s. The Bills also have spent a lot of money since 2007 trying to build a winner. Conversely, the team rarely employed head coaches that were among the highest paid in the league. The Bills ingrained themselves into the fabric of Western New York society in part with their great success in the mid-1960s. The team won AFL titles in 1964 and ’65. Overall, the Bills have posted a 376-436-8 record in 54 seasons. They have made the playoffs 17 times since ’60. While he was demanding in running the team, Wilson could also be charming and self-effacing. Wilson did not like to show off his wealth. He hated to ride in limousines, instead opting to rent a mid-sized Ford whenever he traveled. He told very few people that he was a connoisseur of fine art, and his collection included a Monet. He had a wonderful sense of humor, loved to tell stories and punctuated many of his tales with his distinctive, loud cackle. One of the reasons he got along so famously with Levy was the former coach’s quick wit. The Bills players liked Wilson’s engaging style. He was not aloof. One of Wilson’s pet phrases – “big me; little you” – spoke to his disdain for people who have too high an opinion of themselves. Wilson’s philanthropy was far-reaching and touched many in Western New York. His medical research foundation contributed more than $11 million since 1999 to leading hospitals, including Roswell Park Cancer Institute. His favored charities included the Hospice Foundation of Western New York, the food banks of Buffalo and Rochester, the Ronald McDonald House, the United Way, the SPCA and the Hospice Center of Western New York. His foundation also partners with the Cleveland Clinic, the Mayo Clinic, the University of Miami’s Miami Project to Cure Paralysis, and Wayne State University. He was a graduate of the University of Virginia and attended law school at the University of Michigan before enlisting in the Navy. He served on mine sweepers in the Mediterranean Sea and the Atlantic and Pacific oceans during World War II. He received the Commendation Medal, given for sustained acts of heroism or meritorious service. Wilson is survived by his wife, Mary, whom he married in 1999. She was his third wife. He also is survived by two daughters, Christy Wilson Hoffman and Edith Wilson. A third daughter, Linda Bogdan, died in 2009. I share this stage with some great football people. And the honor comes to one who never played the game. I play tennis. Because in tennis, folks, when you go back to serve, you don’t have to worry about the rush of Bruce Smith. And you go home without any bruises and clean clothes. In closing, I am so appreciative of this recognition. And I must say that I was amazed at the parade this morning. There must have been 200,000 people lining both sides of the street. And the thing that impressed me most was one whole block of people sitting in wheelchairs breathing oxygen, and I just thought to myself, this is America when people like that turn out. Luck prevails. And closing in on 91, I still feel that I have youth on my side. And I want to thank all of you very much for this honor. Thank you.